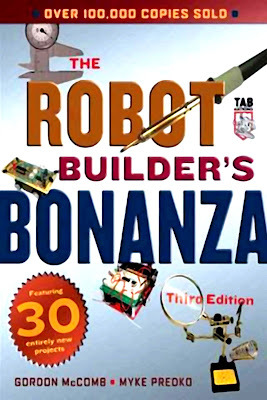 Everybody's favorite amateur robotics book is bolder and better than ever -- and now features the field's "grand master" Myke Predko as the new author! Author duo McComb and Predko bring their expertise to this fully-illustrated robotics "bible" to enhance the already incomparable content on how to build -- and have a universe of fun -- with robots. Projects vary in complexity so everyone from novices to advanced hobbyists will find something of interest. Todo el mundo del libro favorito de la robótica amateur es más audaz y mejor que nunca - y ahora cuenta con el campo de la "gran maestro" Myke Predko como el nuevo autor! Autor dúo McComb y Predko aportar su experiencia a este todas las ilustraciones, la robótica "biblia" para mejorar el contenido ya incomparable sobre cómo construir - y tienen un universo de diversión - con robots. Los proyectos varían en complejidad, para que todos, desde los principiantes a los aficionados avanzados encontrarán algo de interés. The Robot Experimenter. The Building-Block Approach. Basic Skills. Ready-Made, Kits, or Do-It-Yourself?. The Mind of the Robot Experimenter. Anatomy of a Robot. Tethered versus Self-Contained. Mobile versus Stationary. Autonomous versus Teleoperated. The Body of the Robot. Power Systems. Locomotion Systems. Arms and Hands. Sensory Devices. Output Devices. Smart versus Dumb Robots. The Concept of Robot Work. Structural Materials. Paper. Wood. Plastics. Metal Stock. Quick Turn Mechanical Prototypes. Fasteners. Scavenging: Making Do with What You Already Have. Finishing Your Robot’s Structure. Buying Parts. Hobby and Model Stores. Craft Stores. Hardware Stores. Electronic Stores. Electronics Wholesalers and Distributors. Samples from Electronics Manufacturers. Specialty Stores. Shopping the Surplus Store. Finding Parts on the Internet. Electronic Components. Cram Course in Electrical Theory. Wire Gauge. Fixed Resistors. Variable Resistors. Capacitors. Diodes. Transistors. Grounding Circuitry. Integrated Circuits. Schematics and Electronic Symbols. Tools. Safety. Setting Up Shop. Basic Tools. Electronic Tools. Electronic Construction Techniques. Soldering Tips and Techniques. Breadboards. Prototyping PCBs. Point-to-Point Prototyping Wiring. Wire-Wrapping. Quick Turn Prototype Printed Circuit Boards. Headers and Connectors. Eliminating Static Electricity. Good Design Principles. Plastic Platforms. Types of Plastics. Working with Plastics. Building the Minibot. Wooden Platforms. Choosing the Right Wood. The Woodcutter’s Art. Cutting and Drilling. Finishing. Building a Wooden Motorized Platform. Metal Platforms. Working with Metal. Build the Buggybot. Test Run. Hacking Toys. A Variety of Construction Sets. Specialty Toys for Robot Hacking. Robots from Converted Vehicles. PART 3—COMPUTERS AND ELECTRONIC CONTROL. An Overview of Robot “Brains”. Brains from Discrete Components. Brains from Computers and Microcontrollers. Types of Computers for Robots. Inputs and Outputs. Programming Fundamentals. Important Programming Concepts. Robotics Programming. Graphical Programming. Computer Peripherals. Sensors as Inputs. Input and Output Methodologies. Motors and Other Outputs. Sample Output Circuits. Digital Inputs. Interfacing Analog Input. Analog-to-Digital Converters. Digital-to-Analog Conversion. Expanding Available I/O Lines. Bitwise Port Programming. The BASIC Stamp 2 Microcontroller. Choosing the Right Stamp for Your Application. Inside the BASIC Stamp. Developer’s Options. Understanding and Using PBASIC. Sample Interface Applications. BS2 Application Design Suggestions. Remote Control Systems. Controlling Your Robot with a PC Joystick or Control Pad. Building a Joystick Teaching Pendant. Commanding a Robot with Infrared Remote Control. Using Radio Control Instead of Infrared. PART 4—POWER, MOTORS, AND LOCOMOTION. Batteries and Robot Power Supplies. Remember: Safety First!. Increasing Robot Performance. Combining Batteries. Types of Batteries. Battery Ratings. Battery Recharging. Recharging the Robot. Battery Care. Power Distribution. Voltage Regulation. Battery Monitors. A Robot Testing Power Supply. Principles of Robot Locomotion. First Things First: Weight. Tips for Reducing Weight. Beware of the Heavy Frame. Construction Robots with Multiple Decks. Frame Sagging Caused by Weight. Horizontal Center of Balance. Vertical Center of Gravity. Locomotion Issues. Motor Drives. Steering Methods. Calculating the Speed of Robot Travel. Round Robots or Square?. Choosing the Right Motor. AC or DC?. Continuous or Stepping?. Servo Motors. Other Motor Types. Motor Specifications. Gears and Gear Reduction. Pulleys, Belts, Sprockets, and Roller Chain. Mounting the Motor. Connecting to the Motor Shaft. Working with DC Motors. The Fundamentals of DC Motors. Reviewing DC Motor Ratings. Motor Control. Motor Speed Control. Odometry: Measuring Distance of Travel. Battery Monitors. 3 V Zener Battery Monitor. Zener/Comparator Battery Monitor. Using a Battery Monitor with a Microprocessor. A Robot Testing Power Supply. Principles of Robot Locomotion. First Things First: Weight. Tips for Reducing Weight. Beware of the Heavy Frame. Construction Robots with Multiple Decks. Frame Sagging Caused by Weight. Horizontal Center of Balance. Vertical Center of Gravity. Locomotion Issues. Motor Drives. Steering Methods. Differential. Car-Type. Tricycle. Omnidirectional. Calculating the Speed of Robot Travel. Round Robots or Square?. Working with DC Motors. The Fundamentals of DC Motors. Reviewing DC Motor Ratings. Motor Control. Motor Speed Control. Odometry: Measuring Distance of Travel. Working with Stepper Motors. Inside a Stepper Motor. Design Considerations of Stepper Motors. Controlling a Stepper Motor. Working with Servo Motors. How Servos Work. Servos and Pulse Width Modulation. The Role of the Potentiometer. Rotational Limits. Special-Purpose Servo Types and Sizes. Gear Trains and Power Drives. Typical Servo Specs. Connector Styles and Wiring. Circuits for Controlling a Servo. Modifying a Servo for Continuous Rotation. Basic Modification Instructions. Applying New Grease. Testing the Modified Servo. A Caution on Modifying Servos. Software for Running Modified Servos. Limitations of Modified Servos. Modifying by Removing the Servo Control Board. Attaching Mechanical Linkages to Servos. Attaching Wheels to Servos. Mounting Servos on the Body of the Robot. Attaching Servos with Glue. Attaching Servos with Screws or Bolts. Building a Roverbot. Building the Base. Motors. Support Casters. Batteries. Riser Frame. Street Test. Building a Heavy-Duty Six-Legged Walking Robot. Frame. Legs. Motors. Batteries. Testing and Alignment. Advanced Robot Locomotion Systems. Making Tracks. Steering Wheel Systems. Six-Wheeled Robot Cart. Building Robots with Shape-Memory Alloy. Reaching Out with Robot Arms. The Human Arm. Arm Types. Activation Techniques. Building a Revolute Coordinate Arm. Design Overview. Shoulder Joint and Upper Arm. Elbow and Forearm. Refinements. Position Control. Experimenting with Gripper Designs. The Clapper. Two-Pincher Gripper. Flexible Finger Grippers. Wrist Rotation. The Sense of Touch. Mechanical Switch. Switch Bouncing. Optical Sensors. Mechanical Pressure Sensors. Experimenting with Piezoelectric Touch Sensors. Other Types of Touch Sensors. Object Detection. Design Overview. Noncontact Near-Object Detection. Contact Detection. Soft Touch and Compliant Collision Detection. Sound Input and Output. Cassette Recorder Sound Output. Electronically Recorded Sound Output. Sirens and Other Warning Sounds. Sound Control. Audio Amplifiers. Speech Recognition. Speech Synthesis. Sound Input Sensors. Robot Vision. Simple Sensors for Vision. One-Cell Cyclops. Multiple-Cell Light Sensors. Using Lenses and Filters with Light-Sensitive Sensors. Introduction to Video Vision Systems. Vision by Laser Light. Going beyond Light-Sensitive Vision. Navigation. A Game of Goals. Following a Predefined Path: Line Tracing. Wall Following. Odometry: The Art of Dead Reckoning. Compass Bearings. Ultrasonic Distance Measurement. “Where Am I?”: Sighting Landmarks. Exploring Other Position-Referencing Systems. Fire Detection Systems. Flame Detection. Using a Pyroelectric Sensor to Detect Fire. Smoke Detection. Heat Sensing. Firefighting. Experimenting with Tilt and Gravity Sensors. Sensors to Measure Tilt. Using an Accelerometer to Measure Tilt. Constructing a Dual-Axis Accelerometer Robotic Sensor. Alternatives to Store-Bought Accelerometers. to Chew Up Your Furniture. Sensing the Environment: Protecting the Furniture and the Robot. Movement Algorithms. Communicating with the Robot. PART 7—PUTTING IT ALL TOGETHER. Robot Tasks, Operations, and Behaviors. “What Does My Robot Do? : A Design Approach. Reality versus Fantasy. Understanding and Using Robot Behaviors. Multiple Robot Interaction. The Role of Subsumption Architecture. Integrating the Blocks. Basic Program Structure. Allocating Resources. Getting a Program’s Attention Via Hardware. Task-Oriented Robot Control. Failure Analysis. Types of Failures. The Process of Fixing Problems. Setting Up Workshops, Demonstrations, and Competitions. Choosing the Venue. Competition Events. Alerting the Public and the Media. Appendix. Further Reading. Hobby Robotics. LEGO Robotics and LEGO Building. Technical Robotics, Theory, and Design. Artificial Intelligence and Behavior-Based Robotics. Mechanical Design. Electronic Components. Microcontroller/Microprocessor Programming and Interfacing. Electronics How-To and Theory. Power Supply Design and Construction. Lasers and Fiber Optics. Interfacing to Computer Systems. Magazines. Classic Robot Fiction. Sources. Selected Specialty Parts and Sources. General Robotics Kits and Parts. Electronics/Mechanical: New, Used, and Surplus. Microcontrollers, Single-Board Computers, Programmers. Radio Control (R/C) Retailers. Servo and Stepper Motors, Controllers. Ready-Made Personal and Educational Robots. Construction Kits, Toys, and Parts. Miscellaneous. Robot Information on the Internet. Electronics Manufacturers. Shape-Memory Alloy. Microcontroller Design. Robotics User Groups. General Robotics Information. Books, Literature, and Magazines. Surplus Resources. Commercial Robots. Video Cameras. Ultrasonic Range Finders. LEGO Mindstorms Sources on the Web. Servo and Stepper Motor Information. Quick Turn Mechanical and Electronics Parts Manufacturers.